Albuquerque artist Ryan Singer unveils a solo exhibition of acrylic paintings of Navajo Nation landscapes populated by cultural icons. The artist’s vivid imagery showcases original narratives inspired by dreams and childhood memories while interweaving subtle socio-political commentary. “My older sister was really into sci-fi. If she wanted to see a movie, she had to drag me along,” says Albuquerque painter Ryan Singer. “I remember watching Star Wars, Godzilla, and old black-and-white movies like Frankenstein or The Mummy.” Pretty soon, the iconic beasts had traveled from the silver screen into the artist’s psyche—plaguing Singer with vivid nightmares of monsters standing outside his bedroom window or chasing him through his neighborhood. Years later, the artist still has intense dreams, but they’re a welcomed occurrence. “It keeps my mind focused,” Singer explains. “It feels like there’s a spirit or muse guiding me and influencing me.” In his solo exhibition Childhood Mythologies, opening Friday, March 29 from 5 to 7 pm, Singer presents vibrant acrylic paintings imbued with his own youthful legends: Navajo landscapes populated by characters from comic books and popular culture. Most artists try to avoid failure. For Matthew Szösz, it’s a welcome occurrence. He estimates about 75 to 80 percent of his artworks break, but working through the process is the real reward for the glass artist. The Seattle artist is all about experimentation. His oeuvre features unfathomable glass sculptures: woven structures and inflated forms that seem to defy the laws of physics. Matthew Szösz photographed by Corning Museum of Glass. His innovation earned him a spot in the Smithsonian’s Renwick Gallery exhibition 40 under 40: Craft Futures in 2012. His solo show, Minimal Tension, spanned form & concept’s ground floor last spring. To learn more about Matthew, please contact us at 505-216-1256. Click here to view all works by Matthew Szösz in our collection. PLEASE NOTE: This workshop is registration-only. Click here to save your spot. In conjunction with the exhibition Spirits in the Material World, featuring a series of seven garment-like works made from recycled t-shirt fabric and aluminum can pull-tabs, Nika Feldman offers this special workshop. Participants will learn how to let these idiosyncratic materials direct their creative process. Feldman will teach basic embroidery techniques. All supplies included. This class is limited to 20 participants, so make sure to register early! The $40 registration fee reserves your spot. PLEASE NOTE: This workshop is sold out. Please email us at info [at] formandconcept.center to be added to the waiting list. Workshop Hours: 9 am-4 pm, with a one-hour lunch break. In conjunction with the exhibition Since Taos, featuring a collection of felt-based work created between 2001 and the present day, Lisa Klakulak will offer a 2-day course focusing on wet felting techniques to develop three-dimensional forms. Participants will explore the use of resists to build hollow forms while the placement of different weights of wool within the layout preparation determine the concave and convex areas of the form, a method Klakulak terms “extreme differential shrinkage.” Working with a limited palette of wool, the emphasis will be on exploring a plethora of small-scale forms, the relationship of pressure and directional agitation to the felting process, and—of course—enjoying the feel of this humble material. This class is limited to ten participants, so make sure to register early! The $300 registration fee reserves your spot, while the $15 registration fee is due at the start of the workshop. Preview Artist Talk: Friday, February 22, 4-5 pm | RSVP on Facebook. Opening Reception: Friday, February 22, 5-7 pm | RSVP on Facebook. Felting Workshop: Feb. 23-24, $315 | SOLD OUT. Lisa Klakulak presents Since Taos: Contraction of Mass, Concision of Thought. The solo exhibition of 13 felt-based sculptures was created over a period of nearly two decades, since the freewheeling artist moved away from Taos, New Mexico in 2001. 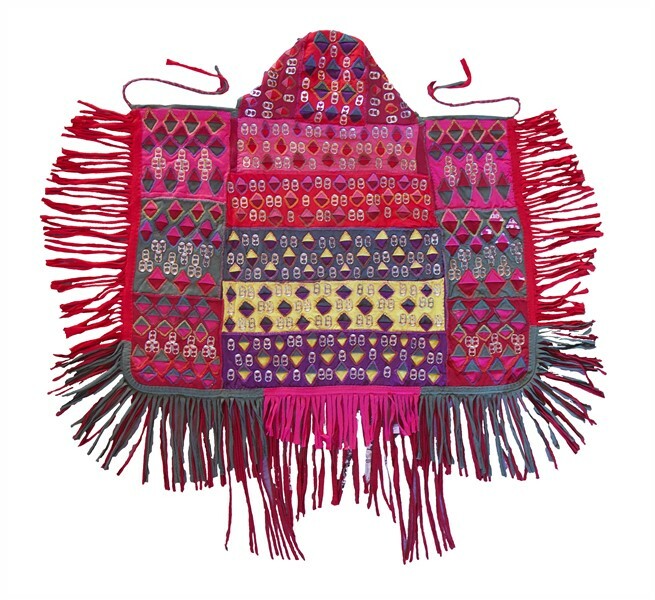 The collection simultaneously acts as a vivid portrait of Klakulak’s emotional journey and manifestation of her unique way of processing the world through fiber creations. “Like any piece of art you make, you are releasing an idea into the object,” Klakulak says. “It’s a completion of a certain cycle, and it’s interesting when someone on the other side spins it into their own emotive universe.” Klakulak’s work voices ideas about growth, human connection, mental stability, and the formation of personhood, as well as social commentary on issues of gender, income inequality, and culture. Klakulak appears at a preview artist talk of Since Taos on Friday, February 22 from 4 to 5 pm. The opening reception directly follows, from 5 to 7 pm. The artist presents a registration-only felting workshop on February 23 and 24, 2019. Learn more about this exhibition. Felting Workshop: Feb. 23-24, $315 | Register Here. Lisa Klakulak appears at this special preview of Since Taos: Contraction of Mass, Concision of Thought, directly preceding the opening reception of the solo exhibition. The series of 13 felt-based sculptures was created over a period of nearly two decades, since the freewheeling artist moved away from Taos, New Mexico in 2001. Klakulak thinks of her life since that moment in distinct phases. “The works are all related to these leaps of faith that I have taken,” she says. “I want to think about, or articulate what I’m thinking about, in a manner that I can translate into a physical form.” Join her for an interactive tour of the show, just before its official debut. Fantastical creatures appear to Susan Aaron-Taylor in her dreams. In the waking hours, the Michigan artist brings them to life, stitching together a hide of handmade felt and an array of natural materials. Unified by Jungian philosophy, Aaron-Taylor’s curious creations metamorphose animal forms with archetypal meaning. Nika Feldman hosts an artist talk for her solo exhibition Spirits in the Material World on Saturday, January 26 from 2 to 3 pm. Spirits in the Material World is an exploration of the coded language of garments, within Feldman’s native cultural context. The show’s title holds multiple references, one being as Feldman explains, “The belief that the spirits of both the maker and the wearer are held within a garment.” Another reference is to a song with the same name by The Police from the 1981 album Ghost in the Machine, which one could argue describes the unfortunate state of realities today. The underlying message within the song that resonates for Feldman is the description of a material culture, which is void of sacredness. Spirits in the Material World debuts with a special reception on Friday, January 25 from 5 to 7 pm. Feldman will host an artist talk on Saturday, January 26 from 2 to 3 pm and a workshop on Saturday, March 16 from 1 to 5 pm. Nika Feldman’s solo exhibition Spirits in the Material World opens Saturday, January 25 from 5-7 pm, coinciding with our sister gallery Zane Bennett Contemporary Art’s Stitched Ink. 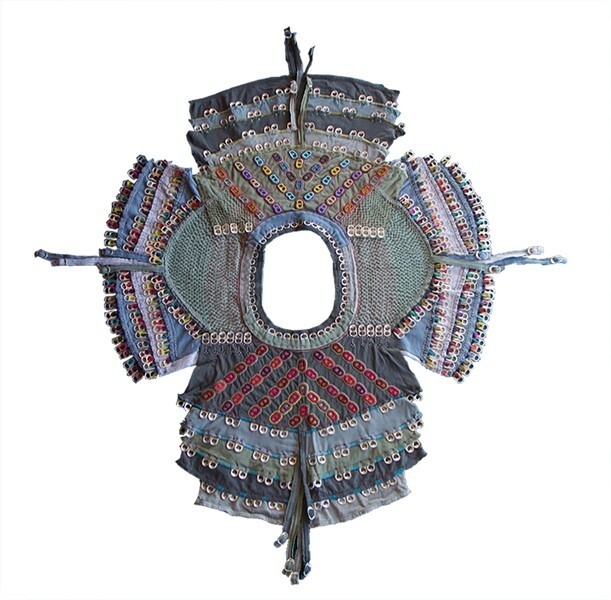 Both exhibitions deal with textiles, but with largely different implications. 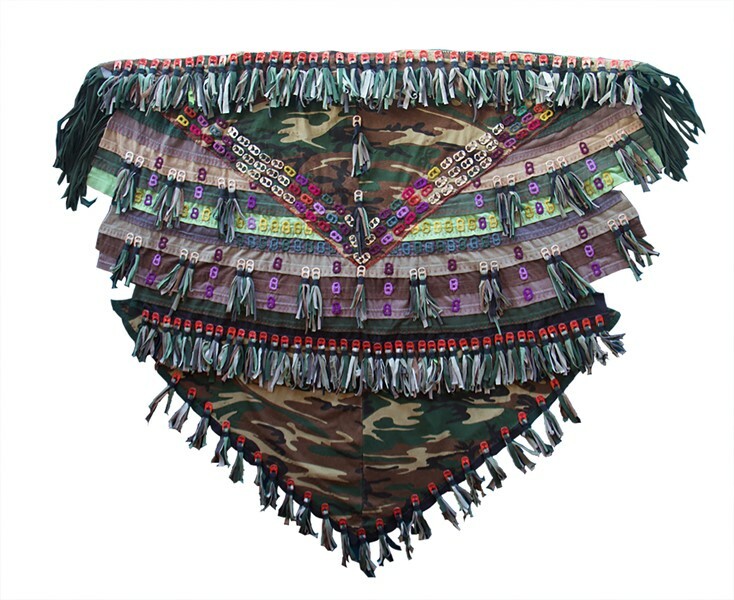 The pieces are intentionally made to be “garment-like” rather than actual clothing items, said Feldman, with the exception of an XXL black T-shirt she didn’t want to cut apart, and instead decorated with tabs and fringe tassles made from other shirts. “All around the world, people wear t-shirts,” says Feldman, a Santa Fe artist who moved to town from Nova Scotia at the end of 2017. “T-shirts were originally an undergarment. But now, through their logos, they inform others about the specific groups, companies, rock bands and organizations we like.” Feldman liked the idea of putting pull-tabs in her work for the same reasons she was drawn to t-shirts. They’re readily available. There’s an abundant supply of them. They’re also an integral part of Western culture. Nika Feldman describes herself as a textile artist, rag picker, and costume stenographer, and her job history includes stints in fashion design, social work, and sorting through clothing in a thrift store. Feldman weaves these disparate threads into a whole in the eight pieces displayed in Spirits in the Material World. Spirits in the Material World opens January 25 and runs through March 23. Nika Feldman will conduct an Artist Talk on January 26 at 2 pm.